इंग्रजीतले नेहेमीच्या वापरातले वेगवेगळे वाक्प्रचार कसे वापरायचे ते शिकू या. नेहेमीच्या वापरातील नवनवीन इंग्रजी वाक्प्रचार शिकायला ऐका English expression. Listen to the audio and take the quiz. हा ऑडीयो ऐका आणि त्याप्रमाणे प्रश्नांची उत्तरं द्या. नमस्कार मित्रांनो...English Expressions मध्ये तुमचं स्वागत. हा आहे तुम्हाला इंग्रजीतले नवनवीन वाक्प्रचार शिकवणारा शो. अन्नपदार्थांचं आपल्या भाषेमध्ये एक वेगळंच स्थान आहे, उसासारखा गोड, फणसासारखा काटेरी अशा अनेक उपमा वापरतात. 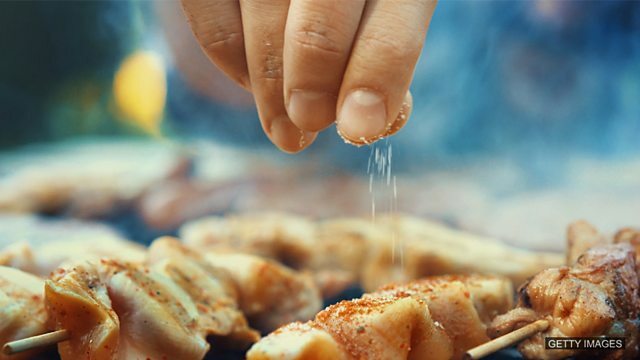 आजच्या वाक्प्रचारात आहे मिठाची चिमूट,‘with a pinch of salt’ काय आहे हा वाक्प्रचार? चला ऐकू. Hello Helen. Thanks for inviting me here. It's a lovely cafe, isn't it? Yes, it is, Neil. Actually, I wanted to ask you a favour. I know you play the piano and I'd like you to teach me. Thank you. I'll pour it. I'd be happy to teach you the piano. Are you buying one? तर, हेलन आणि नील गेलेले एका काफे मध्ये गेलेले, आणि ते चहा घेत होते. पण ते पियानोबद्दल का बोलतायत? No. Our colleague John is giving me one. Yes.He said he's moving to Australia and will give me his piano. Sugar in your tea? I'd take that with a pinch of salt! You said you would take that with a pinch of salt, so I am putting some in your tea. No, I didn't mean put salt in my tea! I was talking about our colleague John. You need to take what John says with a pinch of salt. In English, when we say 'take it with a pinch of salt', we mean don't believe in it completely because it might not be true. Oh. So, John's not going to give me his piano? John's always planning to move abroad and promising things. I'm still waiting for a sofa he promised me last year. He said he was going to Peru! तर, नीलला जॉनबद्दल अजूनही शंका वाटतीये. तो हेलनला म्हणाला, ‘take it with with a pinch of salt’. Take म्हणजे घेणे, pinch म्हणजे चिमूट, आणि salt म्हणजे मीठ. Pinch of salt म्हणजे मिठाची चिमूट, चिमूटभर मीठ. आपण एकादी गोष्ट स्वीकारलेली असते, आपल्याला ती पटलेली असते, पण तरीही मनात कुठेतरी त्या गोष्टीच्या खरेपणाबद्दल मनात शंकेची पाल चुकचुकत असते. अशावेळी खबरदारी घेण महत्त्वाचंच, म्हणजेच, take it with with a pinch of salt. मग ती गोष्ट खोटी ठरली तरी आश्चर्य वाटत नाही, कारण ... आपण खबरदारी घेतलेली असतेच. या वाक्प्रचारासोबत नेहमी takeहे क्रियापद वापरतात. पण यात pinch ऐवजी आपण grain म्हणजे कण, कणभर हा शब्द वापरू शकतो. आणि आपण म्हणून शकतो ‘take it’किंवा ‘take that’ किंवा ‘take what someone says’ ‘with a pinch of salt’. When my cousin says he has absolutely no money, you have to take that with a pinch of salt. He's just mean. I take everything Mary says with a pinch of salt. She tends to exaggerate things. Thank you for warning me, Neil. John is a good person but he can't make up his mind. That's right. But if you ever want to learn to play the piano, I can teach you. I'm not very good at it but I can teach you what I know. And you don't need to take that with a pinch of salt. Oh, you're such a sweetie! A sweetie who likes his tea with sugar rather than salt. आता नीलने हेलनला सावध करण्याच काम तर केलं, पण त्याचवेळी, तिला पियानो शिकवण्याचं आश्वासन देउन विश्वासही दिला. तुमचा असा काही अनुभव आहे का? की तुम्हाला a pinch of salt घ्यावी लागली होती. आज इतकंच, पुन्हा भेटू English Expressionsच्या पुढच्या भागात. Bye! या पर्यायांतून योग्य उत्तर निवडा... बघू या काय काय समजलंय तुम्हाला. Which expression DOESN’T mean ‘doubt that what we are being told is true’? Complete the sentence: My grandfather used to tell the best stories but I always ______ what he said with a grain of salt, because I think he often exaggerated. पुढच्या आठवड्यात पुन्हा भेटूया English Expressionsच्या पुढच्या भागात... आणखी काही नवीन शब्दप्रयोग घेऊन!